Is that a poster in your pocket? Conference poster sessions can be a frantic melee for both the presenter and the viewer. With hundreds of research projects on display and limited time to view them, people struggle to pick out the most interesting. Meanwhile, researchers have the daunting task of cramming their work into a 30 second pitch while they have an editor's attention and hoping that enough of the information sticks for that editor to make a follow up call. It was this situation that gave Darren Sugrue, marketing communications manager for the chemistry portfolio, the idea for the new Poster in my Pocket app, as he watched people taking camera-phone photos of sections of posters. "I thought, there needs to be something that allows them to download a hi-res copy of the poster of interest," he said. "Something that doesn't involve squinting at the screen or guessing half the content." The answer, as Sugrue saw it, was a virtual poster hall. Poster authors upload a hi-res PDF of their work, stick a code on their poster and any attendee who finds the research interesting can use that code to download a perfect copy of the of the poster to their phone. Lyndsay Scholefield[/caption]The app went into production when it won a new media competition staged by the Image Sponsorship group in S&T Journals Marketing and overseen by STM Journals Marketing Communications ManagerLyndsay Scholefield. 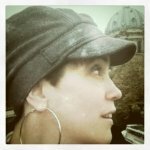 "Darren's idea was a clear winner – well researched, innovative and designed to benefit both the author and delegate experience," she said. Throughout the design process, the app was honed in order to make it as user friendly as possible. Early versions saw an instant messaging feature that would ping authors whenever someone downloaded their poster, but this was abandoned in favor of an option for the author to get an email alert instead. 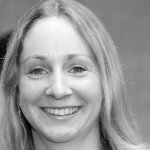 "We thought email was a bit friendlier," explained Aafje van de Hulsbeek, the e-marketing manager who developed the app. "With instant messaging there's this pressure to race back and discuss your poster, but we wanted to give the author the choice." Poster In My Pocket had its first outing at the Euromembrane conference in London at the end of September, with more than 70 of the authors exhibiting posters choosing to upload them. 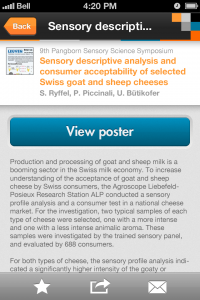 Seeing the app in action, several authors decided to upload their posters on the day. In this instance, the conference team was on hand to provide bespoke stickers to ensure that these authors could let delegates know their poster was now available on the app. The app is now available for any Elsevier-run conference where the marketing manager and project lead are willing to include it. 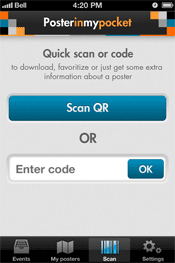 The app is free to use for both poster authors and delegates. And it may soon be making its appearance at exhibitions run by other companies. "For scientific conferences, it represents added value," said van de Hulsbeek, "and so we've had a lot of requests from non-Elsevier exhibitions. The fundamentals of how it works can be copied across quite easily – it's just a question of how we present it." As the team looks to roll the idea out to other companies, they're also working on an update to the app that will turn it into a virtual exhibition kit by including floor maps, speakers, conference info — and even a real-time Twitter feed for users to follow the conference hashtag. "It's still early days," said Sugrue of the app, which has so far garnered over 750 downloads on iTunes and Android. "But with anything, before you can start improving on it, you need to get it out there and see how people are using it and listen to their feedback." 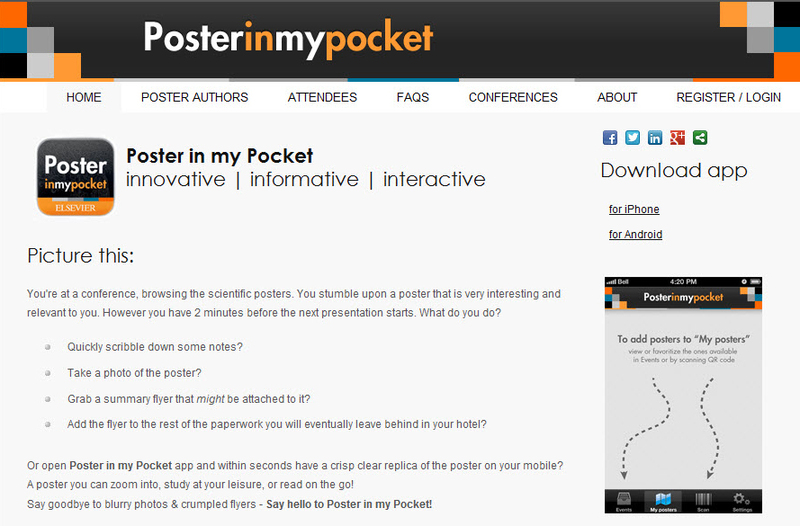 Poster in my Pocket is available to download for free and is available for iPhone and Android. Of course, it could also be used on a tablet. "You just need a bigger pocket," Sugrue quipped. Great idea and impressive result! Congratulations!